I played a Twi’lek Consular at first on my beta, only for 4 levels due to the immense lag at the time. After I found a fix for the lag down to playable level (though still a little sluggish), I started a Mirialan bounty hunter and really liked her, though I only made it to level 5 before the evening ended. She’s the first portrait on the list. Also, credit to the artist for the dominant coat color. I had mentioned Firefly when we were chatting and that turned up when he colored the final inks! I felt slightly guilty winning a contest for a portrait of a character that only existed in beta, but his drawing is too gorgeous to feel guilty about! There’s a framed one on my shelf now. Thanks for the congrats on RA! I’m up to 41 as of yesterday. Still only partway through the Klingon storyline, so I’ll have a lot left to do when I hit 50. I picked up a Collector’s Edition off Amazon and started a Klingon alt once it unlocked (or, actually, an Orion) and a low-level Federation Caitan. That Mirialan was you? I had been admiring those fan works for some time now! That’s great :). 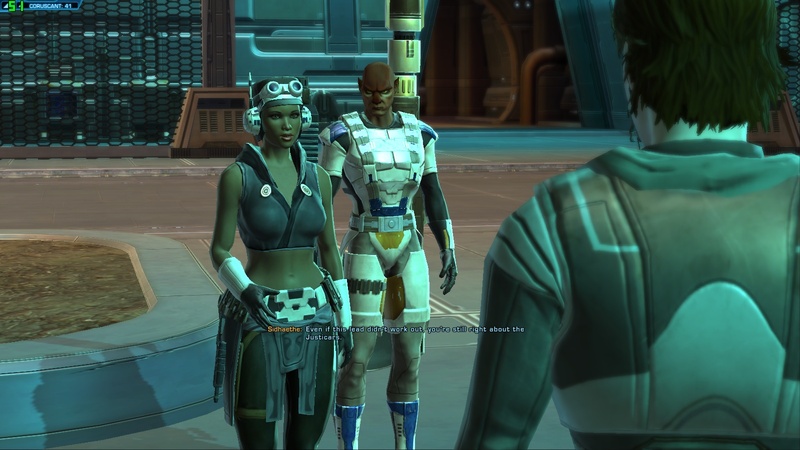 I do wish I’d enjoyed my time in SWTOR more (more to the point, more playstyles/storylines). I would have made room for a Mirialan in there somewhere. I’ve been playing rather casually once or twice a week and was level 45 or so when they announced the free month, and then 46 when they announced a 7 day window to make it to 50. So i power leveled the crap out of it and made it to 50 so I’ll probably be playing another month at least. Okay off topic but I don’t get to talk to anyone about swtor. One thing I noted about playing smuggler is that I’m way too eager to take a lot of the jobs available to me and I’m way too boy scout. Especially if I’m trying to please my first two companions. Corso doesn’t like *anything* unethical, which makes no sense because he’s supposed to be a criminal or at the very least on board to be a smuggler. It took a bit of the fun out of story for smuggler for me but I did have fun. Think i’d have more fun on agent though. Oh feel free to talk about SWTOR here if anywhere – I had been hoping you’d post about your experiences once or twice more on your blog :). And yeah, Aric makes me do things with just the proper amount of military efficiency. If I show the slightest bit of enthusiasm or too much mercy he’s all disapproving glares, ha. I wanted to do the Jedi thing and be all goody-two-shoes but I just couldn’t get into the kinda-melee-kinda-channeled-rangey stuff.